There will be spoilers. Go see the film first if you don't like that. M Night Shyamalan leapt to prominence with The Sixth Sense and Unbreakable, two movies that expertly refracted the supernatural through the lens of Shyamalan's emotional, old school film-making sensibilities. It's fair to say that some of his subsequent films were less warmly received, and that his habit of throwing Twilight Zone-style twists into his plots came to lose a certain freshness. And then there were The Last Airbender and After Earth, two bloated adaptations of other writers' works. However, in a rather more agreeable twist, Shyamalan is now back on form. His last film The Visit was a nastily effective little horror film. 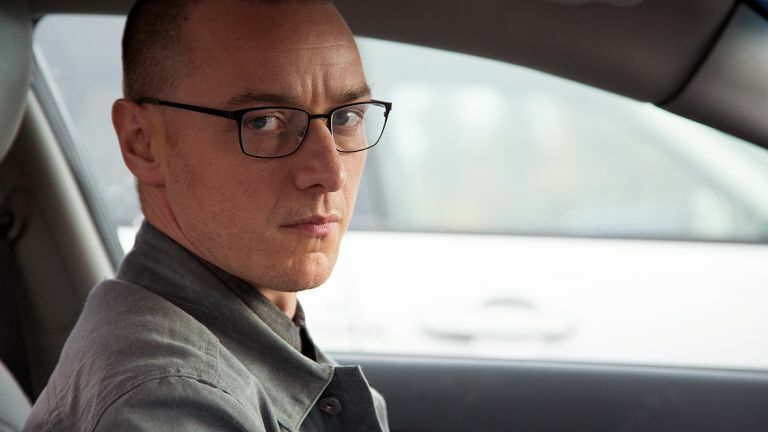 New film Split is way better than The Visit, and a semi-sequel to Unbreakable, in that it puts fantastical, super-powered beings in a recognisably 'real' and grounded world. Despite being about a man with 23 personalities, of whom some are evil, some are children, some are women, and one is literally a monster ('The Beast'), Split manages to be both highly entertaining and also oddly moving and profound in places. So T3.com sat down to talk with Mr Shyamalan about his new film, and his take on tech. It was exactly like the picture above, except that I'm not that good looking and he's not an elderly lady. Please note the following Q&A with M Night Shyamalan contains spoilers galore. What should I call you, M Night? Okay, so, great film. I really liked it! It’s set in the same filmic universe as Unbreakable, of course. Will there be a third film? Yeah there will. I’ve outlined a final movie about this combo, so hopefully I’ll get to do that next. You could call it the MCU. Was Split always intended as a sequel? Obviously, this is a very ‘comic book’ version of dissociative identity disorder. Are you worried about people taking offence because it’s, as they would see it, insensitive about mental illness? Well, y’know, we’ve shown this film to like 20,000 people and I’d say that’s a rare reaction. You know what social media is like, though. I think some people who have said that haven’t actually seen the film… They’ve maybe just seen the trailer. I think viewers will be feeling great emotion for Kevin Wendell Crumb. They should be feeling great emotion, great empathy for Kevin. My favourite part of the movie is when Kevin comes into it. The movie is about trauma. I love talking about really difficult subjects, and tying it to the supernatural. Did you see Filth before casting James McAvoy? No, it was based on his stage work, and his humanity. He’s someone who could play this character with benevolence and empathy and really make it complex. So why is, for instance, [alter ego] Patricia there? With this condition, each of these identities is there to help Kevin – even when they’re doing wrong, they’re doing it to help him. So why would it be beneficial to have a religious zealot woman in your life? Because she’s strong. Because sometimes in your life you need to believe in things SO strongly. She has a righteousness about her. James has this ability both to honour the character and to entertain. Normally that’s not the case. I immediately pictured someone like Nicholas Cage in that role, and it would be a very different kind of film. Did you look at anyone else for the role? Can you say who the original possible star was? Did James work out all 24 personae in rehearsals? No, but we worked out how they would interact and the idea of one persona at a time being ‘given the light’. That’s where one persona is more skilled for a particular moment. So Jeremy is very articulate, so he would do an interview, that kind of thing. Also from that is the idea that three characters can’t be trusted, so they’re kept out of the light and so they’ve staged a sort of coup. Is that something you’ll return to in any sequel? Betty Buckley, who plays Kevin’s therapist, gives a very old school performance, very calm. Betty and I have been friends for a long time… The first time I saw her was on Broadway, when she won the Tony for Sunset Boulevard. Again, her stage training, and James’ stage training, that’s what I leaned on for the scenes between them. Those four scenes are like plays, where they’re having the therapy sessions. That takes up, I think 25-30 minutes of the movie, and I wanted them to be the spine of the movie. You don’t use a lot of CGI in this film, do you? No, The Beast is about 90% James and a little bit of vein enhancement. That’s why you never see James’ body before then because he was working out like crazy and eating and doing all that stuff you have to do. Clothes can hide that but it became a real problem with Patricia because you don’t want her to look like this ripped muscle guy. Do you see yourself as quite an old-fashioned director? How often now do you see a shot where actors are in frame and then after 30 seconds it moves and becomes something else? That used to be commonplace but you hardly ever see that now. Do you see any use for VR in film-making? You know, I storyboard every shot. I do it by hand. But there are these ways now to construct the sets in VR so I can put on the mask and literally be in the space and do the camera moves, block in the characters. ‘The future’ for me, but it’s certainly interesting. Tech-wise, I feel like digital editing is so fast that it’s too fast for us to be in touch with our humanity. In the old days, editing the Godfather, they’d say, ‘Okay let’s look at take 3 of Al Pacino’s line’ and then have to wind on the film, they’d have to talk it over, rewind and play it again, then hang it up, find take 4, wind it on… There’s so much thought. You couldn’t imagine releasing a movie in VR then, presumably. Oh I can definitely see it, because it’s so immersive. The thing for me is how do you take technology and keep the sense of being ‘incomplete’? Because art is a collaboration between the artist and the audience, and together we make the art. Split is in cinemas now.